In rural Zambia, poor families struggle to send their children to school. Boys drop out so they can work to help their families, while girls are often pushed into an early marriage. You can help lead these children on a better path by funding the expansion of a small but impactful Catholic school. 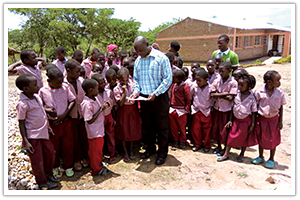 Vubwi Parish needs a new classroom so that its third-grade students can advance to grade four and get the academic and spiritual foundation they need for their lives. Click here for more info or donate now below.